The Truth v. The False Holm Narrative – 10/28/2017 – Kent Hovind v. Robert Baty – The Great Debates! C. Clarke & Danielle Holm made their appearance in Cleburne County, AL with no visible means of support and no transportation. They were having a baby and planned to deliver it, unassisted, in a remote campground in or near Cheaha State Park. After a couple of days in labor they declared an emergency and were taken to the hospital where the baby was otherwise delivered without incident. Because they were unable/unwilling to demonstrate an ability to properly care for the child and were otherwise uncooperative, the State took custody. Since that time C. Clarke & Danielle Holm have remained uncooperative and have repeatedly invoked “sovereign citizen” antics, coupled with religious claims, which has insured the State would be justified, legally and factually, in retaining custody. It’s been over a year now and the State may be in process of moving forward with the termination of parental rights so that the baby might be properly presented for adoption and the opportunity for a normal life in a permanent adoptive home in lieu of continued foster care. 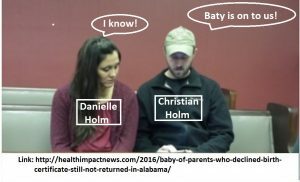 The Holms have an open invitation to face me (Robert Baty) and discuss, openly and honestly, the merits of the State custody of Baby Holm; legally and factually. On October 28, 2017 C. Clarke & Danielle Holm made the following post on their FaceBook page reciting, substantively, their false narrative. We keep trying with attorneys. Nothing works on a backwards foundation that goes against the Creator of all living things. Since the beginning of time, any abstract “system” that becomes artificial and does not flow with the Creator has fallen. These systems become backwards to love, and instead become nothing but fear, force, violence, traps and lies. That is not of the Creator, but of the adversary who leads astray and causes mass confusion. The latest group of attorneys that we were contemplating on hiring very recently, we once again had to back away from. People keep asking us why we do not have an attorney. Bottom line, they cannot be trusted. We have tried MANY times. We have crossed about 10 attorneys off the list. We have edited our response back to them, to take out the names and organizations, as we are not here to attack and point fingers, but only to speak truth of our situation because the truth at this point is our only protection in a world full of cold hearts that are backwards from the Creator. Sorry for the length, but it needs to be known. The attorney who we contemplated hiring, before he entered into our case, we told him not to enter anything, because we already knew it would not work. He entered into the case anyway despite us saying on a recorded call NOT to. Then showed up to court last week anyway and lied to the judge right in front of us, stabbing us in the back, making us look incompetent and along with everyone else, betraying us. And then we got a letter from him after court. This was our response back to him, with parts of his message in quotes. This is so that people in our position know how it works and how attorneys stab in the back when their loyalty is to the state god and to the BAR, not to the Creator of all living things and to innocent families who serve the Creator. They are not for parents, do not let them fool you. (There may be a few far and in between that ARE helpful, but not in our case, thus far). We received your email and have just found a chance now to respond. Bare with us, as it is rather lengthy. Here is where we stand, in regards to your message to us; Your message in quotes. LET the judge lead you in telling your story. We will tell you what we told everyone, multiple times. His “job” is to listen to the audios, read the documents and determine WITHOUT A DOUBT that there was physical harm/abuse done to our child in the measly 33 hours he was in our care under supervision at a hospital, while breastfeeding and perfectly healthy. We have told our story. IN DETAIL…It has all been recorded. We have spelled out our story IN DETAIL. He has read it all. It doesn’t take a genius to figure out if there was abuse or neglect in 33 hours under hospital supervision when all the facts have been presented clearly multiple times. Everyone has already determined there was no abuse or neglect. Every judge that had our case could have done the RIGHT thing, and not one of them has done the RIGHT thing yet. They KNOW they do not have jurisdiction, however they falsely assume it because of selfish motives. The first time we ever met judge —–, we sat in front of him for 3 1/2 hours, at a “status conference” and he reamed us, mocked us, mocked the Creator, threatened us, told us we were FOOLISH for walking on The Creator’s green earth just like Jesus and all of his disciples and any other prophets that have ever walked the Earth. This, coming from a man with a “Master’s in Divinity”. This all has NOTHING to do with our baby, considering he was born IN the hospital and was in PERFECT condition when they kidnapped him. This is why the judge focused on “what ifs” and our beliefs, rather than any actual factual evidence of wrong doing. (This is a KIDNAPPING by the legal definition that the “law experts” go by) and they are continuing to lie to cover it up. Heard every little bit of it. The man has no jurisdiction because we are under the jurisdiction of the Creator and the Creator alone. Not to mention, we did not sign over our son. He is a LIVE, living BABY BOY. A LIVE child of the Creator, with US as his responsible, Creator loving, Creator serving father and mother who obey the Creator and the Creator alone who strive to do nothing outside of love. Kidnapping is a capitol crime in the eyes of the Creator. No injury, no harm, just a perfectly healthy newborn ripped off of his mother’s chest with no probable cause, no warrant, not even a pick up order….KIDNAPPING by force. While everyone gets paid for their “services” as a part of the destruction to innocent families. Are we still making excuses? Everything is on record with the Creator. An official record has been started since they committed the capitol crime of kidnapping our son, and the Creator is still watching everything they do. Whose “rules” must we follow? We choose to follow the LAWS of the CREATOR. DO no harm and LOVE. We have not failed at this. Every single person involved HAS. Are we to create our own court, within creation and summons everyone involved to the court of Angels and see who truly has jurisdiction? Is it the TRUE Creator, OR the ones on Earth that ASSUME godly jurisdiction over another’s family when no harm or injury has been found? Or what about this, we told you we would love for you to stand by our side as a brother, under the Creator rather than “represent us”, because we are to be represented by the ONLY judge of us, the Creator. This has been a growing experience for us both, but the more we speak to attorneys the more we realize, we need to stand in for the Creator, as the Creator uses our mouths to speak truth. Not one attorney has been truthful. Even you, lied to the judge in court right in front of our faces. Now, it is up to each individual person involved to do the right thing. Just because we speak up for the Creator does not mean that a miracle will happen, because evil still exists within the hearts of many. But, our spirits will not be enslaved. Those who go against what is GOOD, are only enslaving themselves. The children of the Creator who choose to do good, are persecuted in a backwards system that go against the Creator. But, it does not have to be this way. EACH person can MAKE the choice to act on LOVE. Each person can change the future for everyone by simply making the RIGHT decision on the foundation of love. Prophets and inspired teachers, and servants of the Creator do NOT have to KEEP GETTING PERSECUTED. The people doing the persecuting can realize they are hurting their own spirits and CHOOSE to STOP. You told us, you do not know how to help unless you are an attorney for us. You, and others at “——-” …all call yourselves righteous men. ——- is known for being a ——- who stands up for the laws of God. So, then why is ——, or yourself not picking up the phone and making a phone call to the President of the United States who he just spoke to a couple of weeks ago, about an AGGREGIOUS case involving a newborn in the State of Alabama to make change to the ENTIRE CPS system STARTING with this innocent family who have been only serving the Creator? Why use this family as pawns within an artificial foundation that is backwards to the Creator’s foundation of all living things? True love, is to STOP sinning immediately and do what is right NOW, not later….not continue to condone the evil for the sake of making pockets fat, or dragging an innocent family through a false court system that is only lying to the people of America, for some ulterior motives or agenda that goes AGAINST the Creator. True love is to pick up the phone, call Senators, President, whoever to make it right NOW. This is a family of servants of the Creator and a BABY BOY involved. Or are we continuing to condone the pedophilia rings that the US government endorses by the support of the CPS system feeding them children? The time is NOW to start repenting, and it can begin with returning our SON, and the President who —-is in direct contact with, making changes to the entire CPS system that is destroying families, and destroying the love of the Creator. All it could take is ONE phone call from —— to President Trump. Why drag it out for MONTHS within an organized, habitual ritual of FALSE LAWS that go AGAINST the Creator? Be love NOW. He ALREADY knows the entire story and is ALREADY biased. All he wants is for us to CONVERT, conform, and bow down to the state god. We are servants of the Creator. We never lived in Alabama. We still do not live in Alabama. 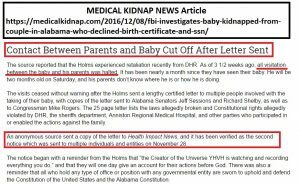 Alabama is presuming AUTHORITY over us, and stole our child on lies, hearsay, deceit, and FRAUD. We were innocently having OUR gift from the Creator in their state, minding our own business, causing no harm to anyone. —– is an intelligent man. The true question is, who is pulling the strings? Who is he getting orders from? A TRUE man of the Creator would never be sitting on a pedestal and judging others when they have done NO HARM or CAUSED injury to anyone, especially their beloved son. A true man of the Creator, would NEVER let this go on for as long as it has gone on for. A true man of the Creator would not see evil before his eyes, and condone it and let it continue especially when an INFANT is involved who has 2 loving parents FIGHTING for him to be returned under the LAW of the Creator. Therefore, DHR should not have taken your child. and tell DHR to give the baby back to you? 1.) Had baby at hospital. 3.) No drugs. No alcohol. As we are servants of the Creator. 4.) NO ABUSE. NO NEGLECT. 7.) OUR SON HAS NO TIES TO THE STATE. WE went against our beliefs for a short time in order to GET OUR BABY BACK RIGHT AWAY…..we showed proof of a LEASE agreement. Shelter, non issue. and we were CLEARED of the mistaken identity, with FINGERPRINTS…..OUR son, OUR flesh and blood, OUR gift from the Creator, was STILL not returned…. We complied at that time with their demands that go against the Creator of all living things. 9.) MONTHS pass by….4 judges recuse. judge —– takes the case….He CLAIMS to have gone over the ENTIRE case. He CLAIMS to have LISTENED to ALL recordings…..he then sat there for 3 1/2 hours barraging us with questions, in which we ANSWERED. We were honest, as we always are. We sat where he wanted us to sit. We answered with love, and we got RAN OVER…..for WHAT??? WE HAVE DONE NO WRONG. What did THEY do to US?? 1.) Violently forced our son off off/ his mother’s breast at ONE DAY OLD. 2.) he regurgitated a LARGE amount of blood from Screaming/crying after they ripped him off of his nourishment of his mothers breast. 3.) THEY created a fake probable cause saying we were “human traffickers and drug smugglers”. This all came out on the stand to be FALSE. NOT us. DIFFERENT PEOPLE. the FBI even cleared us! 5.) Supervisor at DHR continues to create false flags against us in order to discredit and denounce us as intellectual, capable, loving beings. 6.) Our son was taken away from us for 5 weeks WHILE BREASTFEEDING…..HIS nutrition from the CREATOR, DRIED UP. 7.) He was given VACCINATIONS despite our SIGNED REFUSAL of VACCINATIONS at the hospital. 8.) He continues to be fed foods WE DO NOT CONSENT TO and medical visits that only make him SICK every time he goes. We believe in something else. Chiropractors, holistic doctors, organic foods, etc…..the state god disagrees because the state god is ANTI-CHRIST. ANTI-CREATOR. ANTI-NATURAL. 9.) OUR son is getting emotionally/psychologically ABUSED and thrown around like a hot potato in foster care and for WHAT????? Because THEY do not AGREE with OUR lifestyle. There is NO OTHER EVIDENCE OF ANYTHING!!! And we HAVE proven our case. THEY have NOT. They just choose to not follow the truth and to keep lying. Look at the list between what we have done vs. what they have done and tell me TRUTHFULLY WHO is serving the Creator?? And you want us to GIVE jurisdiction to a group of people who have ABUSED us, VIOLATED us, SLANDERED US, SEPERATED us and DESTROYED our FAMILY. Not to mention, you are telling us YOU recommend we go against the LAWS of the Creator, and bow down to those who are backwards to the Creator? Isn’t that what is wrong with the world today? WHO in this situation has done EVIL Works?? Delivering a beautiful, baby boy at the hospital and refusing poisons that are NOT against “mans laws” to refuse? Was it WALKING WITH the Creator BEFORE the baby was born, and protecting all living things and spreading love and joy to the less fortunate while we used all of our will power to WALK while loving others? Was it feeding our child, with his NATURAL GOD GIVEN breastmilk, while his loving father fed his loving mother? Was it his loving father holding his loving mother as the baby was held by his loving mother? Which of these things were evil? A happy, healthy family basking in the love of their new born baby boy? Or were the “rulers” or “authorities” who decided to LIE and MAKE UP Probable cause to STEAL our child with GUNS on their side BY FORCE and FRAUD considered evil? Is there no such thing as the “RULERS” and Authority” becoming BACKWARDS, and CORRUPT and therefore, the children of the Creator who are LISTENING to the Creator absolutely SHOULD NOT OBEY CORRUPTION of those who do EVIL works?? Or just because the bible has one verse everyone goes back to about “obeying authority” we are to listen to the authority that is condoning evil against our family? Judge Roy Moore got kicked out of his position as a Judge for dis-obeying “authority” in regards to a monument. and is now considered a hero. They are going against the Creator in regards to OUR BABY. Not a monument, or an image. Anyone in the position of having to CHOOSE between the Creator of all living things and their SON as we are being asked to choose, should be fully supported by “righteous people”, not condemned and blamed for serving the Creator and getting persecuted by those in “authority”. thou shalt have praise of the same”. Do you really BELIEVE what THEY have done is GOOD? What does a child of the Creator who SERVES the Creator do when the people in “authority” are now BACKWARDS from the Creator?? We have already determined THEY have done WRONG. We have already determined this is UNGODLY. We have already determined that This entire case is FULL of sin, and NOT on our part. Why does everyone keep trying to get us to FORGET about the truth and stop speaking truth from the mouths that the Creator GAVE to us to do so? “For he is the minister of God to thee for good. What if this “minister of God” IS DOING THE EVIL???? Do children of the Creator who have DONE NO WRONG, back down and allow this supposed “minister of God” take the reigns and allow MORE EVIL and force US to sin by NOT speaking truth of the Creator’s law??? Are we to follow EVIL works, JUST because someone is in a position that was bought and paid for? What if the TRUE authority is the poor prophet walking the earth getting persecuted by those in “authority” and no one is listening to him? Therefore, no one is listening to the Creator. Hmmmm…Sounds a little bit like Jesus when he was here, doing the SAME THING. He stood up strong against their persecutions as THE Authority FOR the Creator. Jesus was the only true authority. The JUDGES claimed and assumed authority and killed him. He was told to obey them as well. yourselves will not lift one finger to help them. and you build their tombs. And Jesus also taught in temples, synagogues, and most importantly COURTS. He was AGAINST the court system. The very system in place today. And 2000 years later, people still have not figured that out. These words in the bible, are just that….words in a bible. We are to be connected to the Creator without needing to open a book, for the laws of God are written on our hearts, inside of our souls and are to be lived out daily. Mark 12: The Lord our God, the Lord is one. We were living out these laws of love to the best of our ability when our son was KIDNAPPED by sinful, corrupt, armed men and women in “authority”. Not only did we not break the Creator’s laws, we did not even break MAN’S oppressive LAWS that they try and use against us. These people (including the judges) have broken the Creator’s laws AND their own laws! But you say, “bow down to the “authority”. Our only AUTHORITY is that of the Creator on the true foundation of all living things, not of evil works on a backwards foundation of all dead things. We serve the living Creator of all living things whose ONE and ONLY law is LOVE. Judge —– has had AMPLE amount of time to look at everything in the case….everything…since DECEMBER 2016. 10 MONTHS….and KNOWS we did not cause injury OR harm. Therefore, he is not only NOT reproving evil, he is CONTRIBUTING to it, which is just as evil. IF he were to return him NOW, that could be a start of him repenting, and forgiveness would ensue….is he doing that? Is our son home with us??? Therefore, the lies, the deceit, manipulation, fear tactics, conversion, power of persuasion all continue not only by DHR, but by ALL attorneys and the judge HIMSELF. So, until people start repenting and stop using witchcraft/voodoo/ sorcery in the form of fictitious abstract laws upon a backwards foundation on the innocent and until they start following the LAWS OF THE CREATOR, of LOVE on a true foundation of ALL LIVING THINGS….EVERYTHING THEY DO on a BACKWARDS foundation that goes AGAINST the Creator, will be considered EVIL in the eyes of the Creator. We did not make the Creator’s laws. We only try to follow them. Can any of them say the same as they continue abusing us, harassing us, slandering us and keeping us and our son away from one another? We are trying to SAVE our child. The Creator does not separate. The DESIGN of our child came from the THOUGHT of the Creator, from the SPERM of his father and the LIFE came from the Creator as well as his mother. This was a miraculous event between the true love of man and woman and their love with the Creator, and those falsely taking the position of “god”, came in and separated FOR THEIR OWN AGENDA. This in itself is yet another grave sin, for them to FORCE adultery AND idolatry on us by forcing themselves into OUR relationship with each other AND the Creator. This is in direct violation of the Creator’s LAW of LOVE. It is completely backwards. Why do you continue making excuses? WE have been separated (against the will of the Creator), from our perfectly healthy, beautiful baby boy that the Creator gave to US and you are saying if we do not bow down to the EVIL that STOLE (thou shalt not steal) our child with FALSE WITNESS that it will be OUR fault? And NOW, you are saying if we do not bend and bow to the ones UPHOLDING this evil, that it will be OUR fault?? This is a classic case of using fear tactics, manipulation tactics and power of persuasion to make the victim feel GUILTY for BEING abused. Both of us have had PLENTY of experience in our lifetime with narcisstic abusers and we know these tactics quite well. Thankfully we have found the love within to make sure we would never do this to another who is being abused and violated, and instead we make sure to have compassion and LOVE for those people and help them through the pain of being victims of abuse. This is not about EXPOSING the system. This is about STANDING UP FOR THE ONE WHO GAVE US LIFE and not allowing another generation pass by that is completely void of true love. This is about standing in for the Creator and speaking TRUTH. Did the “system” not tell Jesus to SHUT UP as well? They tried, and then they KILLED HIM instead. Everyone in the “system” CLAIMS to follow Jesus, as they continuously stab him in the back over and over and over again by going against what he taught. The court system in itself is BACKWARDS to the Creator of ALL living things. The court system governs the UNAWAKENED minds. We are AWAKE and in OUR RIGHT MIND, connected to the Creator of ALL LIVING THINGS. with great patience and careful instruction. In regards to the very court system that stole our beloved son. Everyone knows there was no injury, no abuse, no harm. Instead nothing but fictitious make belief, ideas and opinions in one’s own mind that servants of the Creator must be “delusional” so, they do not deserve a child, as they then force us and twist our arms to bend to their will and go against the Creator. cannot make even one hair white or black. When you sit in a court room, with a man in a black robe who sits on a pedestal and JUDGES those “below him”, and you raise your right hand to SWEAR to speaking truth, who are you swearing to? We answer to the Creator. Why must we swear to man to speak the truth we already speak under the Creator and for the Creator? But yet, you are imploring us to Obey the false authority that is going against LOVE, and swearing an oath to the one who condemns. We answer to the Creator and the Creator alone, for the Creator is our only judge. We follow the Creator, who gives life. We do not obey man who takes life. Now, if there were other brothers and sisters who protect life and are also born again, in their right minds, we stand for them, and beside them, as we are no better than anyone else. But, as for men and women who go against the Creator, we are not obligated to “obey” their false ways. For, we are awakened children of God and we strive to awaken as many other of our brothers and sisters that we can in the process. EVERYDAY without our beloved love child, made from true love. Our son is suffering everyday. WE did not cause this. And WE have done NOTHING but listen to the Creator, and as we are growing, yes there may be moments of growth to get through, but overall we strive to obey ONE and only one…the Creator. LOVE and DO NO HARM. comes from afar? To whom will you run for help? We are all living beings of the CREATOR. Just as a star shines consciousness down on the Earth, where the Earth then uses it as fuel for life, we must grow the same way by shining light (speaking truth) in the form of compassion and evidence. Tough love is what is needed when children of the Creator are choosing to not listen to the Creator. Tough love can sometimes seem like an attack. We speak with truth and we are filled with love, because we want all spirits to make it back to the Creator of all living things. The world has been led astray by witchcraft and sorcery. When the only thing real is LOVE that gives us LIFE. The ones upholding these fictitious laws, games, court rooms, do it in a way of fear, violence, force, weaponry, scare tactics, kidnappings, etc….we stand in love. And we will continue to do so. It is up to each individual person, to either attack this love and persecute it, or do the right thing and realize they are only judging themselves and trapping their own spirits when they do it to servants of the Creator who follow the laws of Love. When we say we love you, we mean it. People have grown so cold, they can barely say it back to us. But we will continue to love and continue to speak truth and continue to try our hardest for the Creator to bring the people back to LOVE, in a dark world full of hate, deceit and fraud. 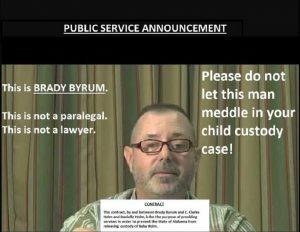 Kent Hovind’s Brady Byrum Meddling In Baby Holm Case!